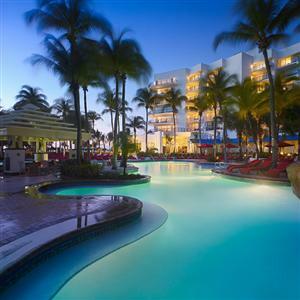 Aruba Marriott Resort is a beachfront hotel located at Palm Beach, Aruba. Experience snorkeling and scuba diving at Marriott Aruba with Red Sail Sports one of the many watersport highlights at Aruba Marriott Hotel. Be sure to ask about submarine adventures with Atlantis Adventures Aruba. This is one of the Aruba resorts that is non-smoking so it is family friendly while you are on your diving vacation. Accommodation at the Marriott Aruba allows you to awaken to ocean views from a private terrace. You have choices among garden, ocean or pool vistas. Get your grub on at nearby restaurants such as Captain's Galley, Pavilion Beach Bar & Grill, Papiamento Restaurant or Pinchos Grill & Bar.